Staten Island is the least populated and the greenest borough in New York, and is an ideal place to call home. With more than 170 parks, three public golf courses, and miles of hiking trails, Staten Island offers residents ample opportunities to relax and enjoy the picturesque surroundings. To learn about real estate on Staten Island, see our Overview of Staten Island Real Estate Development, or search all Staten Island property listings. Click the links below to learn more about the communities that make up Staten Island. If you'd like to see Staten Island MLS listings organized by neighborhood, see Staten Island Neighborhoods. For those interested in relocating to Staten Island, there are a large number of schools to choose from in the region, as well as a variety of shops, services, and medical facilities. 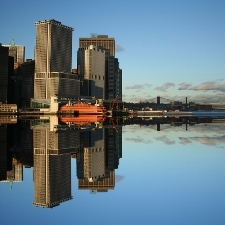 Transportation is provided by the NYC Transit system, the Staten Island Railway, and the famed Staten Island Ferry, which connects residents with Manhattan. The Verrazano-Narrows Bridge brings Staten Islanders to and from New Jersey. Every weekend you could visit a different golf course, park, or beach on Staten Island. Clove Lakes Park, for instance, is a fabulous "forever wild" site, well known for its 300 year-old tulip tree. Gateway National Recreation Area has three sites on Staten Island - Great Kills Park and Beach, Miller Field, and Fort Wadsworth - which offer many recreational opportunities. Great Kills Park and Beach has a swimming beach, bathhouse, snack bar, nature trails, marina, and playing fields. Miller Field includes two WWI military aircraft hangers, athletic fields, picnic areas, and a community garden. Fort Wadsworth offers guided nature tours and hikes. South Beach's Boardwalk attracts thousands of walkers, runners, and cyclists. The boardwalk lies along sandy South Beach, and features tasty eateries, the Ocean Breeze Fishing Pier, and a play area for the kids. Spend days exploring Snug Harbor's Cultural Center and Botanical Center, with its fountains, museums, galleries, and scenic gardens. Residents also enjoy a variety of performing arts events throughout the year, at the center. There is also the popular Alice Austen Museum, a historic landmark and a museum chronicling Alice Austen's life. Children and adults alike enjoy the exciting Staten Island Zoo with its wide range of sea and land creatures. Or for a peaceful experience, The Jacques Marchais Museum of Tibetan Art, set on the side of Lighthouse Hill, is a great place to visit. Historic Richmond Town is not a reconstruction - it's the real thing. Visitors are encouraged to come early because they will want to stay the whole day exploring the village and checking out one of the oldest houses in the country. The Staten Island Children's Museum is also a must-see for children and adults. With many interactive displays and incredible details, this is an experience your children will not soon forget. Contact our Staten Island NY real estate team for more information. Whether you're buying or selling your home, our expert agents are ready to help.